It’s been a year since the horrific attack on the City of Boston. It’s been a year since I rushed to the hospital to see my injured friend and waded through eerily vacant streets of the Back Bay flanked by blood, debris and restaurants’ abandoned place settings. It’s been a year since I was reminded that people are capable of doing really terrible things. And it only took 20 seconds to taint the lives of so many. And it’s been a year since I was reminded that people are also capable of doing pretty amazing things. They can pull together in a time of need, help each other and treat total strangers with the love and respect you would typically attribute to your own family. A year ago today, the world pulled together to support the City of Boston and everyone affected by the tragedy that occurred on Boylston Street on April 15th, 2013. Today, we remember those we lost and appreciate those who fought for their lives and succeeded. I’m proud to know one of those survivors and have felt honored to play a part of her recovery. On Patriot’s Day, my boyfriend is going to be participating in the military march of the Boston Marathon route. Beginning at 6AM, he will start what amounts to around seven hours of marching down a 26.2 mile course. Seven. Hours. I’ll be cheering him on along the way, hopping on the T to see him at different checkpoints throughout the day. He’s not only a lucky participant in the world’s oldest annual marathon – he’s sharing his support for our country in a year that feels like it needs it more than ever. If you find yourself on the sidelines to cheer on the runners and see servicemen in uniform marching the route, please take a moment to wave, salute, and appreciate their service to our country. 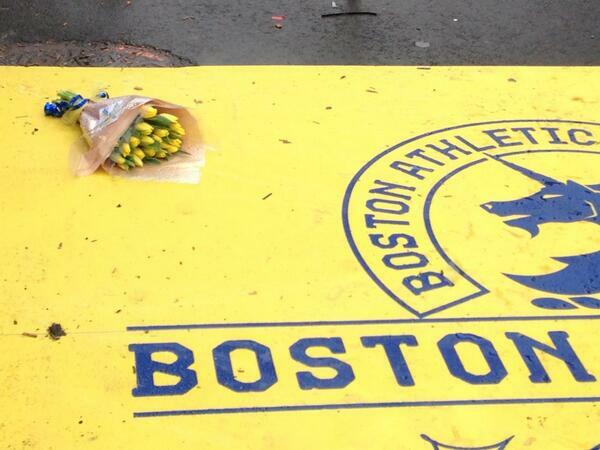 I’ll be the teary-eyed blonde sporting a “Boston Strong” shirt and beaming with pride.